International Women's Day is on March 8th 2014. 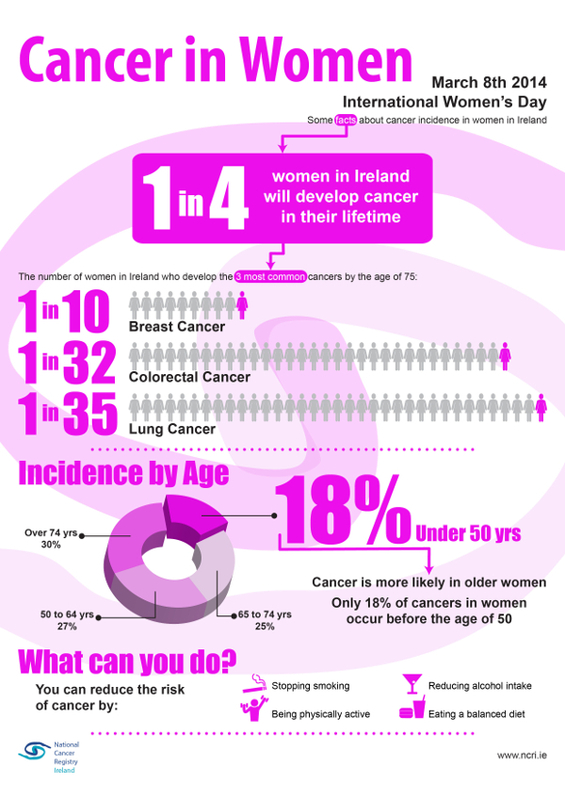 For International Women's Day on March 8th 2014, the National Cancer Registry have put together facts about cancer incidence in women in Ireland. One in four women in Ireland will develop cancer in their lifetime, with breast cancer, colorectal cancer and lung cancer the most common cancers in women. Cancer is more likely in older women, with only 18% of cancers in women occuring before the age of 50. To reduce the risk of cancer, women can stop smoking, be physically active, reduce alcohol intake and eat a balanced diet. For more information about cancer in Ireland, view our factsheets, which provide a useful one-page summary of statistics for particular cancers.